These are not light matters, and the interface wisely treats them with respect, connecting them in ways that strengthen their voice collectively. 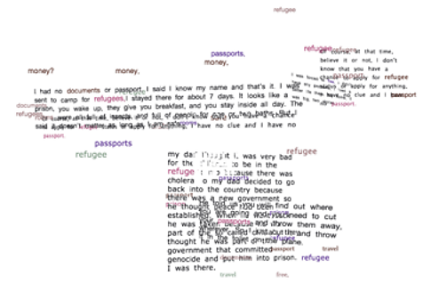 As readers select words on the screen, narrative excerpts appear, along with other instances of the same keyword and other related ones. As one continues to activate and read other texts, previously selected ones remain on screen for a time, slowly rotating on a three-dimensional axis until they eventually fly apart in multiple kinds of animations and fading away. This evokes a sense of the oral origins of the piece, not in their kinetic qualities, but in the way they linger: present but not quite re-readable. These clips are a visual echo of their screen utterance— reverberating throughout each unique performance.